Fry bacon, drain, and crumble. 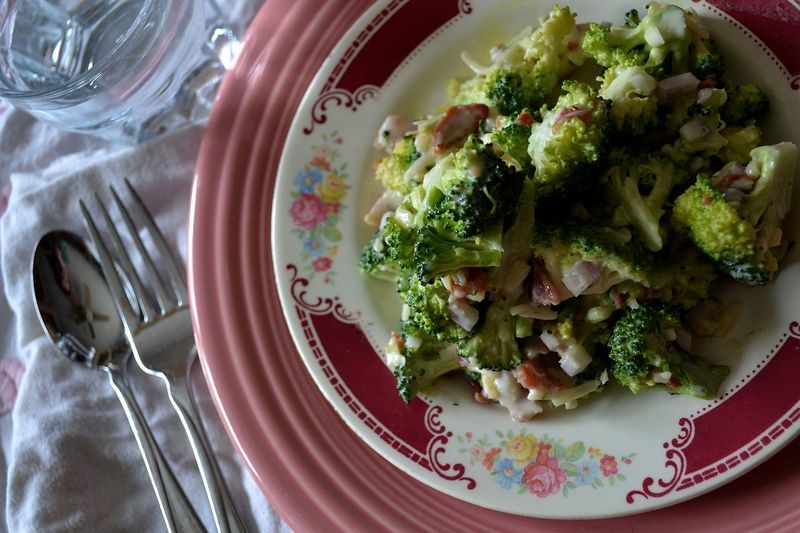 Combine bacon with cut up broccoli and onion. Mix vinegar, mayo, and sugar together, drizzle over cut up broccoli mixture. Top with cheese. This is a simply delicious, and nutritious, salad that I’ve made twice in the last month. It keeps well in the refrigerator, and is a perfect little lunch, side dish, or snack. The recipe can be adjusted according to taste. I use less bacon and only half the sugar, to make it more healthy. This entry was posted in Uncategorized and tagged food by Shanda. Bookmark the permalink. Broccoli salad is so good! hi shanda…….a friend of mine gave me this recipe, probably 10 years ago now. i love it too! great to bring for a potluck or picnic. and i will gaze at your new header with hopes of spring. we still have snow on the ground here in wisconsin, too. Can’t wait to try it..looks so delicious! That’s my favorite salad — and there are so many things one can do to change it up — some are listed in comments here. I use Splenda, low-fat mayo, and rice vinegar, and leave out the bacon. Red onions add color, as do cranberries and raisins — and I love the idea of adding cheese! Thanks I need ideas so this is perfect! OH YUM! Wish I could pop over! so pretty and looks delish! I’ve had a similar salad before and it’s so yummy! I like the new header!